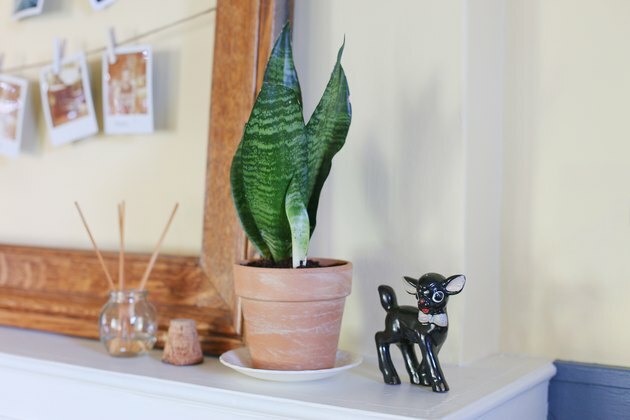 Mother-in-law's tongue (Sansevieria trifasciata), also called snake plant, is one of those houseplants considered hard to kill. It was once grown commercially as a fiber source for making rope and other products. It is rated one of the most efficient air-cleaning plants, and removes toxins like formaldehyde and benzene from the air. Grow it outdoors in warm climates or indoors anywhere. Mother-in-law's tongue can grow outdoors in U.S. Department of Agriculture plant hardiness zones 10 through 11. 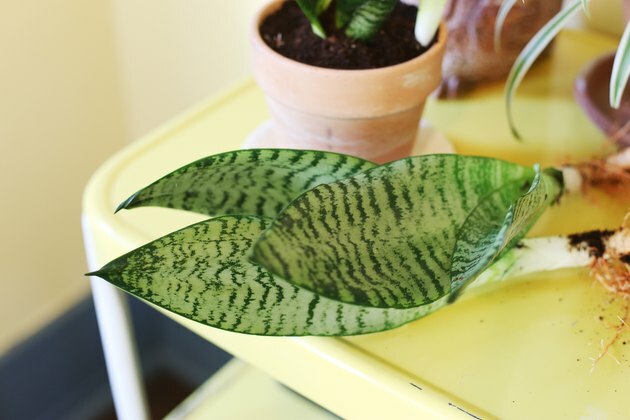 This limited growing range can be extended to USDA zone 9b if you plant it in a sheltered spot, but mother-in-law's tongue is more often grown as a houseplant. Outdoors, the plant can spread out of control because of its aggressive roots. Mother-in-law's tongue's spear-shaped leaves are 2 to 3 inches wide and grow up to 3 feet tall. Several cultivars are available, with the same hardiness as the species. Gold-banded sansevieria (Sansevieria trifasciata "Laurentii") has wide yellow margins on the edges of the long leaves. Bird's nest sansevieria (Sansevieria trifasciata "Hahnii") is a dwarf cultivar that grows only 6 to 8 inches tall. Mother-in-law's tongue is not picky about soil. It will grow in a wide range of soil types and textures as long as the soil is well-draining, including soil with low fertility. As a succulent, it has excellent drought-tolerance and is a good fit in water-wise gardens. It will grow in full sun or full shade, though cultivars with pale leaves will bleach in intense sun and variegated varieties may lose their color in dense shade. Part sun is best. 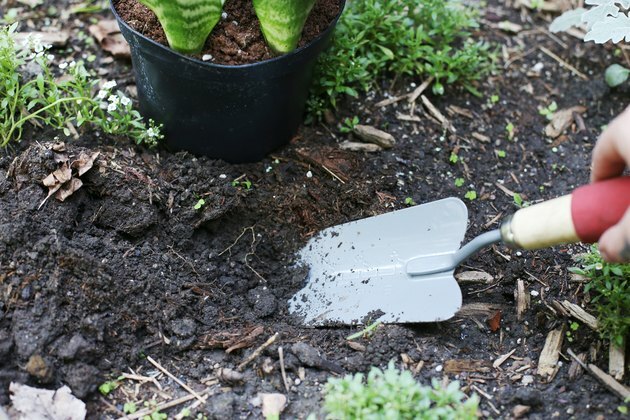 If the soil doesn't drain well, amend it before planting by mixing in decomposed granite, coarse sharp sand or pumice. Add enough of the amendment that the soil feels as damp as a wrung-out sponge after you water it. When planting mother-in-law's tongue, dig a hole the same depth as the container and slightly wider. 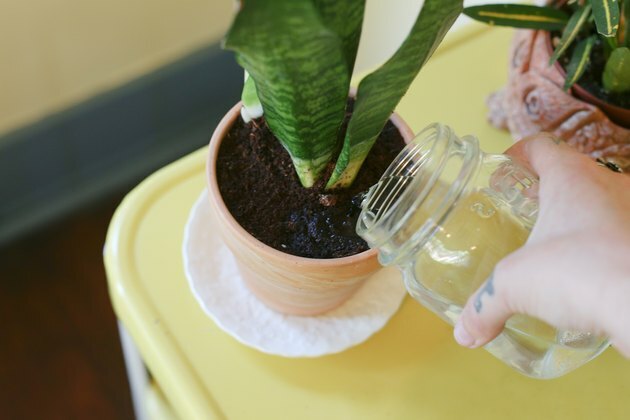 Remove the plant from the container, and use your fingers to loosen any roots that are tangled together at the edges of the root ball. Set the plant in the hole and fill in around the root ball. Make sure the plant is sitting in the ground at the same depth it was planted in the container. You can grow mother-in-law's tongue in plastic or ceramic pots. 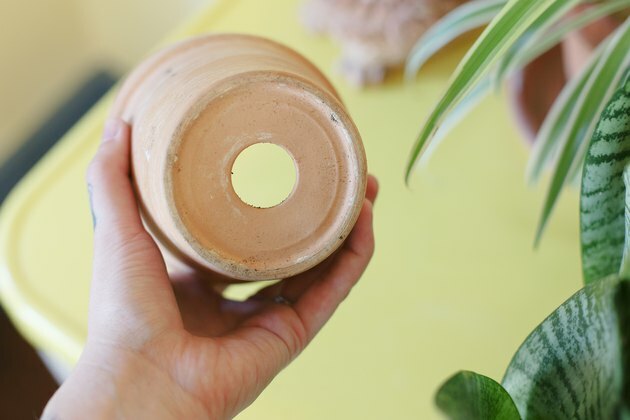 If you tend to overwater, an unglazed ceramic pot will dry out faster and help keep the roots from rotting. Always use a pot with drainage holes. A bagged cactus potting mix works well for planting mother-in-law's tongue. You can also make your own mix by combining standard potting soil with crushed volcanic rock, pumice, coarse sharp sand, poultry grit and/or perlite. The final ratio can vary from one-half to two-thirds potting soil, with the remainder composed of your choice of drainage-increasing amendment. When moving a mother-in-law's tongue plant into a new pot, loosen any roots that have become pot-bound and wrap around the rest of the root ball. Set the plant in the new pot at the same level it was growing in the old pot, and fill in with new potting mix. If you trim any roots or use pruning shears to remove dead leaves, disinfect the shears by soaking them in 1 part bleach to 3 parts water for five minutes. Rinse the shears with clean water and air-dry before use. For both container and in-ground plants, water immediately after planting to settle the soil. If the soils settles enough to leave a depression or holes, fill in around the plant with more potting mix or garden soil. In the garden, mother-in-law's tongue requires little water. If the plant leaves start to shrink or pucker and lose their shine, the plant is drought-stressed and needs watering. In containers, water plants no more than once a week. While plants are actively growing, keep the soil as damp as a wrung-out sponge. In periods when the plant isn't growing quickly, water enough to keep the soil from drying out completely through the whole pot.